1. Preheat the oven to 180°C, place the sweet potatoes onto a baking tray and bake for 35 – 45 minutes. 2. Place the drained chickpeas into a bowl, season with S&P and drizzle with olive oil, crush them slightly (with your hands) and set aside. 3. For the Tahini cream, place all the ingredients into a blender and blend until smooth. 4. 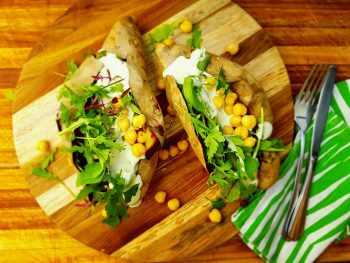 Once the potatoes are fully cooked, allow them to cool slightly, slice a slit along the top of the potatoes and then stuff with the crushed chickpeas and micro herbs, finally drizzle the Tahini cream over and sprinkle with Maldon salt.